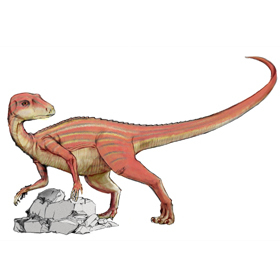 The Abrictosaurus was a small herbivore from the early Jurassic Period. Its estimated weight was less than 100lbs and was about 4 feet in long. This dinosaur had large caniniforms in both its upper and lower jaws measuring .4 inches for the top and .7inches for the bottom. Suggestions have been made that the Abrictosaurus lacked tusks and it was just a primitive feature. The Abrictosaurus also had smaller, less powerful forelimbs its closely related dinosaur Heterondosaurus and one less phalanx bone in both the fourth and fifth digits of the forelimb. The Abrictosaurus is known from remains of two seperate cases. Both were found in Lesotho and Cape Province in South Africa. One skull was found in 1974 and dinosaur was described at that time by Richard Thulborn, thus named Lycorhinus. A second skull was found in Africa by James Hopson in 1975. It was redescribed and named Abrictosaurus.